With the astonishingly successful unmanned probe of Saturn and its satellites, man's fund of knowledge about his own solar system has expanded remarkably. Yet science has found few substantial clues about the origin of life on our unique planet-Earth. Is some source of information being overlooked by science? Man's quest for knowledge about the universe took a quantum jump in mid-November, 1980. Voyager 1, an automated miracle of technology, relayed to earth an incredible stream of information from the planet Saturn and its cluster of 15 moons-three of them newly discovered. Included were nearly 8,000 pictures and a flood of data recorded by the space probe's 10 different scientific instruments. 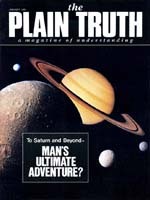 Measured was everything from the Saturnian system's atmospheric conditions to its magnetic field and radio waves.